In the run-up to the launch of Series 11, there was a lot of frankly tedious jibber-jabber in the fandom about how ‘the Doctor should never be a woman,’ and how, for instance, ‘she’ll be Nurse Who now’ – a piece of idiocy so strong it manages to be sexist in two directions at once, while emasculating previous companion Rory into the bargain, solely on the basis of his job. We love Juno Dawson for many reasons across the page-count of The Good Doctor, but first and foremost, she takes on these attitudes and makes them a central strand of the problem to be solved in her Thirteenth Doctor novel. On a world where a religion has sprung up based on a previous visit of Team Tardis, oppression is rife in the name of ‘the Good Doctor’ – and the Thirteenth Doctor faces all of these attitudes to her physical body, and why they disqualify her from being who she is. 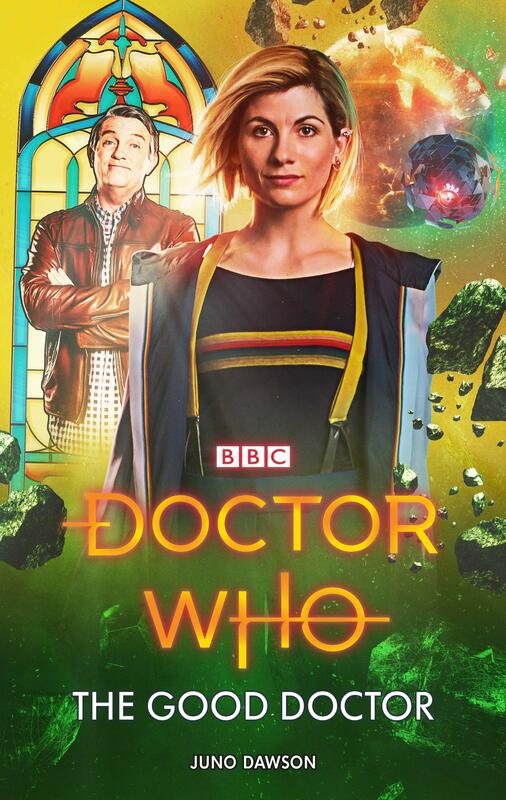 It’s a masterpiece of take-down, without being ‘just’ about the fact that the Doctor now has a female form and carries with it all the weight of other people’s (and particularly men’s) opinions on what that means she’s capable of. In fact, The Good Doctor’s about lots more than that. It’s a blending of lots of elements, and ends up feeling like one of those rock solid Pertwee six-parters, but with a crisp, brisk tone and a modern storytelling style. On the planet Lobos, the Loba (a race of canine bipeds, with a longstanding connection to humanity) are at war with incoming humans when we start out, and Dawson gives us, in one extended sequence, a more concise, precise distillation of the nature of the Thirteenth Doctor than has yet been seen on screen. She stops the war, builds the peace between humans and Loba and then, in typical Doctor fashion, strides off to her magic box and disappears. Clearly, the Tardis’ temporal drift compensators are knackered, because they return some 600 years in the future. And things have…changed. Really rather a lot. There’s a techno-nod to Four To Doomsday about the place, but chiefly, women are not allowed out after dark without a chaperone, and are generally subjugated (there’s also a fab nod to The Handmaid’s Tale, as surveillance camera-bots are known as ‘eyes’ to report any infraction). The power structure of Lobos is run by human men (and priests, no less), and women are considered a lower type of creature. Not, however, as low as the Loba, who have been enslaved both by the doctrine that dogs are man’s best friend and by the ferocity of humans driven by the sure and certain knowledge that their god has given them instructions. Their god, incidentally? That would be the Good Doctor. But it’s not as simple as it sounds. Juno Dawson makes the most of a full Tardis to show us life on every level of Lobos, Graham and the Doctor swanning about with the priests who run the show, Yaz making contact with the Loba Resistance movement, and Ryan finding his way through a loophole into a niche where both worlds collide. There are two generations of love story, an arena duel straight out of Peladonian history for the Doctor, a terrorist threat to blow up the main temple of the Good Doctor, shedloads of gender politics and doctrinal blasphemy, and, for Yaz, quite a lot of crawling through filth – because it’s not really cracking Doctor Who unless at least one of the companions is mercilessly punished. What The Good Doctor ultimately provides is pin-sharp characterisation of all the members of Team Tardis – you’ll definitely have a stronger handle on who the Thirteenth Doctor actually is, deep down, after reading this book than you might have from the TV series so far (up to and including The Witchfinders) – and a multi-stranded, multi-level Doctor Who story that’s perhaps more memorable than anything in Series 11 so far, with plenty of fighting of foes, righting of wrongs, and the belief that people and love can overcome anything, even an entrenched religion based on privilege and the impact of past mistakes. It’s also a lesson, both to this new Doctor and her new friends, in the dangers of careless talk and of leaving footprints behind on the cultures with which they interact, even if, like the First Doctor in The Ark, the initial impacts look entirely positive and helpful.